Mark Baum was born in what is now Poland in 1903 and barely survived emigrating to the United States in 1919. For thirty years thereafter, the painter succeeded in the New York art scene. But despite the popularity of his work, he decided in the 1950s to move away from his representational paintings, and until his death in 1997, developed an abstract art practice that merged spirituality with creativity. Eventually, Baum moved to Maine to paint fulltime from a converted barn and continue to contemplate spirituality. 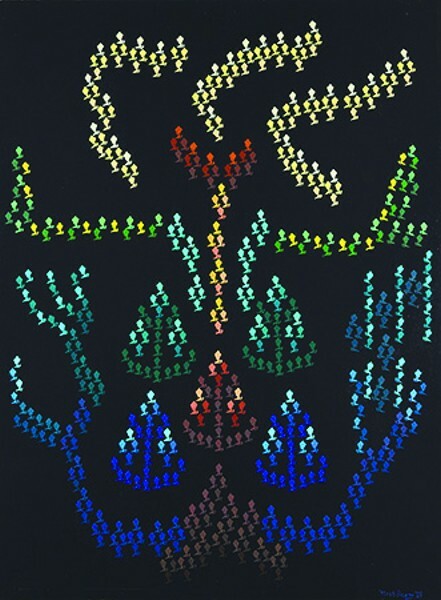 During that time, Baum began using a singular diamond-like symbol in various iterations to create all of his compositions, which he considered psychic maps to an enlightened existence. A retrospective of Baum’s late work, which has never been shown before, is now on view at Krowswork Gallery (480 23rd St., Oakland) in the show Mark Baum: Elements of the Spirt. At 2:30 p.m. on February 27, the gallery will host a free panel discussion on the artist’s life featuring the Contemporary Jewish Museum of San Francisco’s chief curator Renny Pritikin; UC Berkeley’s Center for Arts, Religion, and Education director Elizabeth Pena; and Baum’s son, Billy.